Free games: Win a Steam key for beautiful new sky-island MMO Worlds Adrift! Most post-apocalyptic landscapes are grim plains of scuzz and sand but there are exceptions that instead foresee beauty after the planet gets blitzed. Worlds Adrift is one of those, as after its world is shattered by a calamity, what’s left is an endless azure sky, fit for sailing. This is what you’re faced with when you enter Bossa Studio’s new MMO – now on Steam Early Access – and so you must assemble a crew, build a ship, and start exploring what remains of past civilisations. The environments are user-generated, meaning they are built by the community, and enjoyed by all as adventures across sky islands and voyages inside dark caves. There’s more to the game than that, too. Most impressively, nearly everything inside its shattered world is driven by physics systems – chop down trees and they’ll fall realistically, swing on your grapple hook with the right momentum to make it across chasms, and if you want your ship to fly straight and at speed then you’ll have to build it correctly for that purpose. 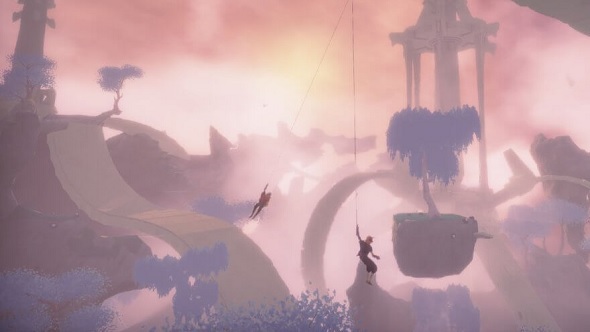 To celebrate Worlds Adrift’s arrival on Steam Early Access we have teamed up with Bossa Studios to offer ten lucky people a Steam key that unlocks the full game. If you want to be one of those winners then you will need to enter the giveaway competition via the widget below.